Our philosophy on Quality is quite simple, if we cannot validate, measure or verify compliance as contracted we don’t make it. 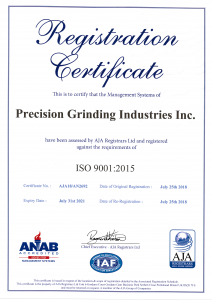 PGI is ISO 9001-2008 registered. Our inspection processes and the equipment utilized allows for measurements to the strictest tolerances. Precision parts requires precision measurement, PGI is capable of both. Proper controls using Exact JobBOSS our MRP system allows for detailed traveler instructions, setup sheets, first article and in-process inspections and quality alerts notifications. JobBOSS allows us to track your parts from start to finish, handle blanket orders and JIT requirements. Tool calibration and equipment maintenance are controlled using JobBOSS UniPoint, combined with continuous employee training we strive to assure a consistent quality path for part processing, tracking and on time deliveries.